Bidding for the movie rental company will start at $290 million. At least, that's what Blockbuster is hoping will happen. Blockbuster, the beleaguered and bankrupt rental chain, has asked the courts in New York to allow it to auction itself off to the highest bidder. Blockbuster says that putting the company up for sale will allow it to move forward, and would be a big step in its efforts to get out of bankruptcy protection. Blockbuster announced that it had entered into a "stalking horse" agreement with Cobalt Video Holdco, a consortium of fund management companies, for $290 million. If the courts approve Blockbuster's request to go to auction, this offer would act as a reserve bid that other interested parties would have to beat if they wanted to acquire the company. The deal includes both Blockbuster's domestic and international arms, with stores expected to open as usual during the bidding process. If Blockbuster's request is approved by the courts, then interested parties would have thirty days in which to bid for the company. Blockbuster predicts that it will close a sale by April 20th. 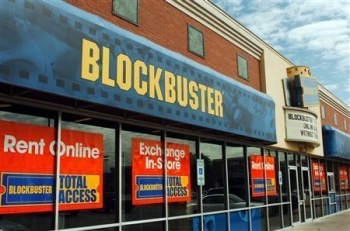 Jim Keyes, Blockbuster's CEO, said that the auction would allow the company to get competing bids, and help ensure that whoever bought it had a clear vision for its future. He said that the new owners would be able to take advantage of Blockbuster's many strengths, including a strong library of titles and an internationally recognized brand name. Blockbuster filed for Chapter 11 bankruptcy protection in September of last year, with more than $900 million dollars in debt. Since then, the company has spent millions on advertising, before announcing its intention to sell itself.